AL ROKER reporting: This morning on TODAY'S TRAVEL , the best bets. Whether you're looking for a cheap family vacation spot or the best national parks , Budget Travel magazine polled its own intrepid travelers for their top picks. And here with the 2010 Readers' Choice Awards is Nina Willdorf , the magazine's editor-in-chief. Good morning, Nina . Ms. NINA WILLDORF (Editor-in-Chief, Budget Travel Magazine): Hi , thanks for having me. ROKER: So you guys got a huge response. Were you surprised at how big the response was? Ms. WILLDORF: We were blown away. I mean, we knew we had an engaged readership but 164,000 votes is incredible. And we're giving this over to them. Our October issue is going to be built entirely around their favorite things, including the cover, which you can vote on today at budgettravel.com. went to: San Francisco . This is actually where I'm from. It was a bit of a surprise for us. We were all sort of expecting Paris to win. But what we found out was something across this poll, people are very into America right now. And San Francisco obviously has so many things to celebrate. The hills, the cable cars, the water. ROKER: It's just undeniably beautiful. Ms. WILLDORF: It certainly is. Now, Best Family Vacation Spot kind of combines a little history with the ability to go to some theme parks . ROKER: Absolutely. Williamsburg , Virginia. You know, again, we were sort of expecting Disney World to win; Williamsburg won. You've got the Colonial Williamsburg , it's an affordable place to go. You can see re-creations, etc. Thirty-six dollars a ticket for an adult, which is about half the price of a normal theme park . ROKER: And then you've got Busch Gardens , so some great roller coasters, Bavarian beer halls. It's a really fun destination for families. Ms. WILLDORF: Kind of the best of both worlds . Ms. WILLDORF: Now when we go to national parks , I don't know if this is a surprise, Yellowstone , Best Park . ROKER: This was not a surprise. I mean, it's the oldest national park , it's the most popular. Last year it had -- it broke attendance records with 3.3 million. This was -- it's sort of a classic. You've got Old Faithful . ROKER: I mean, what more is there to say? Ms. WILLDORF: Now, a lot of cruise lines out there, but Royal Caribbean came out on top. ROKER: Yeah. Royal Caribbean is having a banner year, and bigger is better in their world. They came out with Oasis of the Seas in 2009 . Six thousand people on that ship. This year another big one, Allure of the Seas in December. So anything you want to do on one of their lines, you can do, including shrake -- shake Shrek 's hand. Ms. WILLDORF: Wow! All right, there. Donkey, get away. Island getaways always a big vacation favorite. Ms. WILLDORF: But usually when you think islands I think the Caribbean . Ms. WILLDORF: Not so this -- for your readers. ROKER: Yeah, this was a bit of a surprise. We got Maui . And I think one of the reasons is that, you know, Hawaii has been especially affordable over the past year, and the deals are just there. In fact, Hawaiian Airlines is running a promotion right now called Endless Summer that they're extending through the fall. Round-trip air fare from the West Coast to Maui , $308. ROKER: And so, you know, the value is really there for travelers. You get to the beach, you get the Haleakala volcano. It's great. Ms. WILLDORF: Economy's kind of tough, but people still looking for that affordable exotic vacation. And the Dominican Republic came out on top. ROKER: Dominican Republic won, and it's sort of set to overtake Jamaica , we think, in terms of popularity in the -- in the Caribbean . One of the reasons, airfares are really kind right now. They're down about 8 percent to the Dominican Republic , which is great, and the peso-to-dollar ratio is really remaining low. And you've got all-inclusive resorts. ROKER: It's really that kind of easy island escape close to home. Ms. WILLDORF: People like to shop when they go on vacation. Ms. WILLDORF: Big Apple , number one. ROKER: ...in New York. And whether you're walking down Fifth Avenue or going to the sample sales in the garment district , the flower district, it's a bounty in New York City and our readers loved it. Ms. WILLDORF: And then airlines are always getting a bum rap. Southwest Airlines did pretty well for you, number one. Rental cars, Enterprise won. Ms. WILLDORF: And then for folks who like those apps. Ms. WILLDORF: You say the number one app for your readers, Flight Tracker . ROKER: Flight Tracker , 4.99 for this app. You're holding in your hand all the information that you're going to need if your flight gets canceled. It has information on 1400 airlines. So don't wait in line. Just pull out this app. Bangkok Gov. 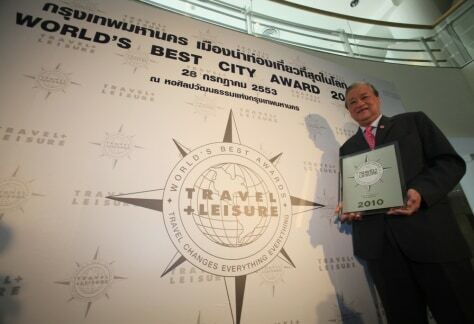 Sukhumbhand Paribatra poses with World's Best city award during a press conference in Bangkok, Thailand, on Wednesday.